The beauty of the Hooper-Bacal model is that it's incredibly flexible. Forms can be exceedingly simple, or you can customize them to add items and columns to suit your particular needs. You can download the barebones version of the form by clicking here. It will open up a new window and display the PDF form. Here's a quick explanation of the columns. Below there is also an image of the form. If you click on the thumbnail, it will open up the large version. Or click here to open in a new window so you can consult it as you read. The starting point. 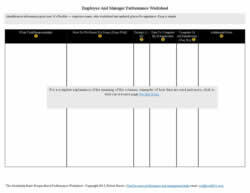 Manager and sit down, and list no more than five major responsibilities, job tasks, projects. Don't list trivial ones, but only the most important ones. Remember that even if two employees have the identical job descriptions and job titles, they will actually be doing different things, so don't expect or try to have their responsibilities be identical. Jobs evolve. Here, employee and manager list the criteria used to determine when, if and how well the task or responsibility has been carried out. In MBO terms, this resembles standards of performance. While it's good to establish measurable objective criteria, remember that it's hard to measure the IMPORTANT things objectively. We get around this by having both employee and manager agree (based on negotiation) on the criteria. Employees need to understand what is most important in terms of their jobs, so it's important to add this to the process of identifying future job tasks. In the form, you can assign a priority of 1-10, but in fact, it's probably better to use a smaller scale, let's say from 1-3. After all, if the responsibility is unimportant or of low priority, maybe we shouldn't even include it. Job responsibilities are of two types. Project based tasks usually have a date by which the project should be complete. If that's the case, enter it in this column. The other kind of responsibility is "ongoing". For example a receptionist's major job may be to answer the phone, and of course, that's a "routine" part of the job that he or she does every day. There's no completion date. So, mark it as "ongoing". If you like, you can insert a date for ongoing tasks that represents when manager and employee will sit down to discuss how its going. Simple yes or now goes here. It's basically whether the responsibility or task has been completed or whether performance is satisfactory. Usually filled in at project end, OR at a final terminal review discussion. This is a much more important column than you'd think. It serves to document any discussions about progress, commitments by manager to help, a place to note need for further development or coaching. Also a place to formally document extraordinary performance or problems that need to be addressed. 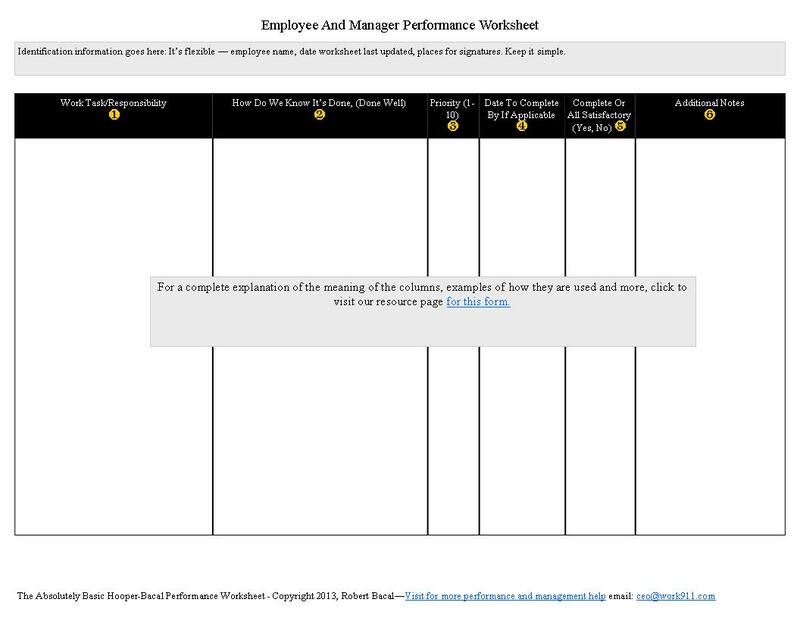 Notice that the most detail goes into the first two columns, which are future oriented and have to do with what the employee needs to do. That reflects the importance of looking forward, not backwards, and places the emphasis on the PLANNING of performance, not the review of performance. The actual "review" columns are so simple, and can be completed during the year, or at the end of what we'd normally consider the period of review. With five job responsibilities, for example, it takes about 10 minutes to complete the whole review. No surprises since this form is used all year long to track progress, communicate and document. Lots of variations and additions are possible. I'll be posting more on this in the forms section.